Human rights and wrongs are not determined by Justice, but by Might. Disguise it as you may, the naked sword is still king-maker and king-breaker, as of yore. All other theories are lies and lures. If you saw yourself with the eyes of justice you'd change your lifestyle . Don't seek for justice in this world, Don't seek more than you need. When commencing your journey towards justice choose the path that minimizes regret. The opposite of poverty is not wealth... In too many places, the opposite of poverty is Justice. Being transparent reflects commitment towards justice and truth. It's speaks that one stands for moral value. One who stands for moral value commands respect and honor of all. Justice which gets delayed is often denied. Seekers of justice should be provided justice swiftly. Delayed justice has no meaning. Injustice means being unfair or unreasonable when it comes to forming an opinion. The moral arc of the universe bends at the elbow of justice. 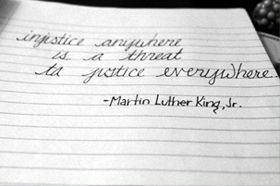 Injustice anywhere is a threat to justice everywhere.